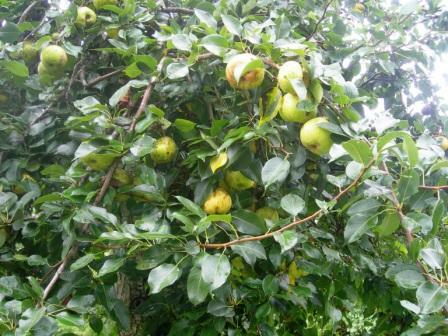 We have a pear tree in our yard at the Crossroads, and it is heavy with ripe pears. I don’t know what variety it is, but it produces an abundance of sweet pears. The tree has been here a long time, and it was planted by Leo’s mother. I wish she were here to ask what kind of pear tree it is. 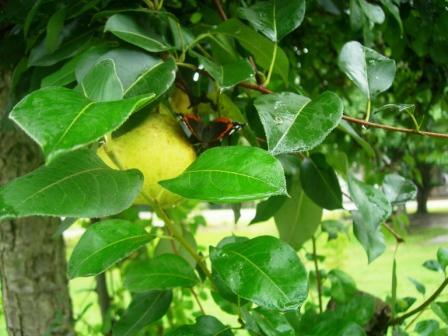 The butterflies and the bees are attracted to the ripe pears. One day this week, I saw a squirrel in the yard nibbling on a pear that had dropped to the ground. So what do you do with an abundance of pears other than feed the wildlife? Today I made pear chutney. Last year I made pear honey and pear relish, but I thought I’d try something different this year. Are you a chutney fan? I am. It pairs beautifully with pork and chicken, but we don’t do chicken here. Leo is allergic to all fowl. That means no turkey for Thanksgiving at our house! If you are unfamiliar with chutney, it is a sweet and sour condiment that originated in India. It is usually made with fresh fruit. Sugar gives it the sweet taste and vinegar and onions give it the sour flavor. The ingredients are mixed together and simmered slowly. Additional spices give it an extra zing and make the flavor more complex. In addition to serving it with meat, it can be used as a quick appetizer. Pour some on top of a block of cream cheese and serve with crackers. Or, spread some goat cheese on some toasted French bread slices and top it with a spoonful of the pear chutney. Or think about how good it would be on top of baked brie! 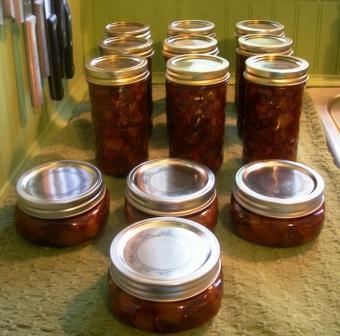 Since I have so many pears, I canned my pear chutney. If you’d rather not can it, or if you don’t have the canning equipment, you can still put the chutney in sterilized jars with lids and refrigerate it for up to 6 weeks. This recipe will make 11-12 half-pint jars. First, you will need about 5 pounds of pears. Rinse the pears and wipe them down. Don’t peel the pears. Core them and then cut them into small slices. Roughly chop them into pieces that are approximately 1/2 inch long. Next, put a quart of cider vinegar, a box of dark brown sugar, and 1/2 cup water in a very large pot. Bring this mixture to a boil, stirring to dissolve the sugar. 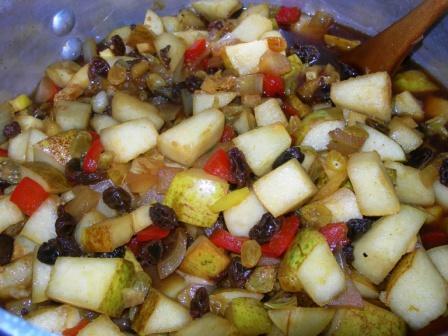 Add your chopped pears to this mixture along with these ingredients: 1 box dark raisins, 1 box golden raisins, 2 chopped onions, 1 chopped red pepper, 1 chopped lemon, 5-6 cloves of chopped garlic, chopped fresh ginger (a piece about 3 inches long), 1 cup honey, 1 cup light Karo syrup, 3 tablespoons molasses, 2 tablespoons Worcestershire sauce, and 1 tablespoon of each of the following: mustard seed, ground cinnamon, paprika, curry, and salt. Reduce the heat and simmer uncovered for 2 1/2 hours. Stir the mixture occasionally. When it is finished cooking, sterilize your jars and rings. Heat your lids but do not put them into boiling water. Ladle the mixture into the hot jars and add the lids and rings, filling and sealing one jar at a time. I processed my jars in a boiling water-bath canner for 15 minutes.This recipe made 9 half-pint jars and 4 smaller jars today. Look at these cute little jars. Just the right amount for using the pear chutney as a quick appetizer! 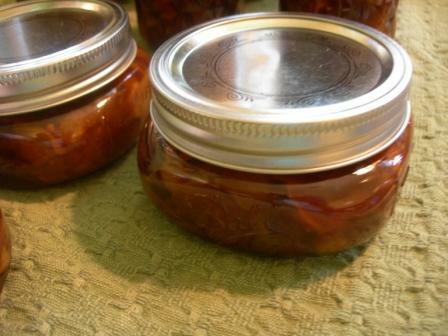 If you would like a printable version of this recipe for Spicy Pear Chutney, click here. Your Pear Chutney looks delicious! The jars cooling on a counter or table are always so pretty and give a feeling of warmth for the soul. Just stopping by from OTMM, thanks for sharing! You’ve been busy! It looks delicious! I love chutney — so many uses for it! We had friends who gave us a lot of pears last year and I ended up making pie filling and lots of pear tarts 🙂 Thanks for sharing your recipe with us! Hi Jane…Have you considered making pear sauce as opposed to apple sauce? It’s made the same way…or you can make pear-apple sauce, too. It can be frozen! Your chutney looks delish! I love this with a little cheese, YUM! Jane, I can think of so many wonderful uses for this delicious sounding chutney! YUMMY! I love to can the fruits of the summer, so I will give this a try! Your directions are so well done! I hope you will consider adding this to my weekly recipe and menu meme, ON THE MENU MONDAY. It will be up and ready to go around 8:00 on Sunday night. 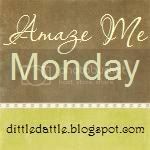 My readers will love this recipe… as I do! WOW. Mouth watering. I have never heard of a fowl allergy? Poor guy. I have never tried anything like this, thanks for sharing. I am a big pan of brie with pears. Hi Jane, I have the same pear tree. We moved here two years ago and have pear and apple trees. So I can’t help you with the name, but they are also sweet and look like yours. I must try your cutney recipe. Last year we just gave them away. Jane, the pears look yummy and I bet the squirrel enjoyed his pear. The butterflies are loving our Impatiens now. 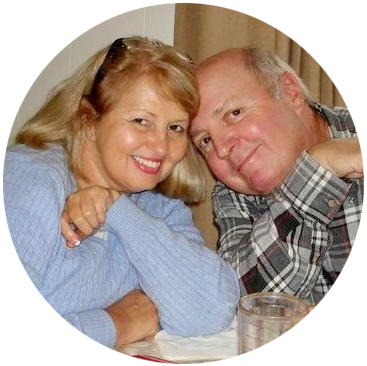 Love your button…I need one, too. where did you find those cute little jars? did the lids and rings come with? also, did you use a pressure canner, or just a bit pot to process the chutney? My goodness this looks good. In our last home we had the same pear tree. I thought it was a Bradford pear but someone told me Bradford was the decorative non productive blooming one. That makes me unsure but they sure do bare well. I always made relish. I wish I had seen the recipe. It looks so good and I love everything that goes into it. 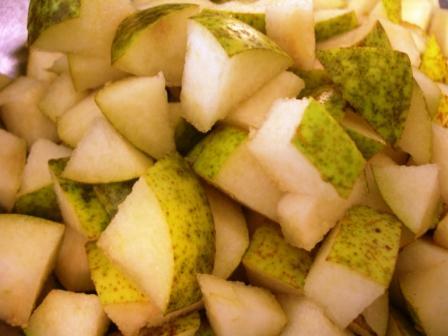 This looks delicious & I just happen to have a pear tree full of juicy, sweet pears. Thanks for sharing. 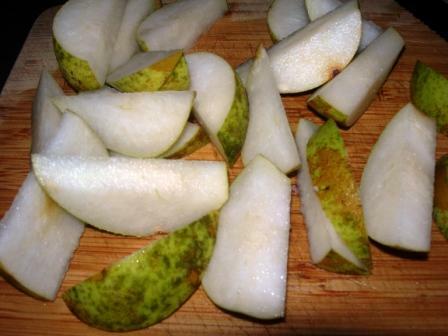 I have been canning pear halves, we love them as pear salad on lettuce with a little mayo and cheese on top. They are so easy to do! 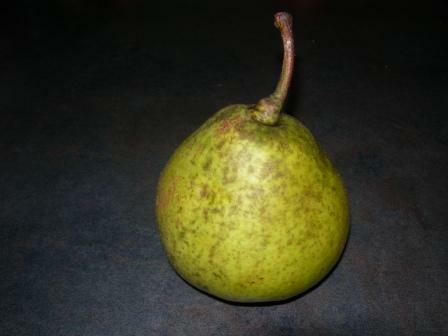 Take one of your pears and a branch with leaves to your county extension office- if they can’t identify it- they can e-mail a photo to state and get a professionel to identify it. This is a free resource. find recipes to use the honey. THIS looks terific. Will try it!